Arthur J. 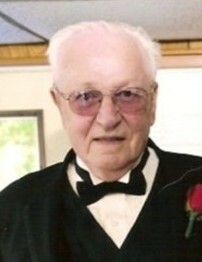 “Junior” Magyar, 88 of Gaithersburg, MD, formerly of McKeesport (Liberty Boro), PA, passed away suddenly, but peacefully surrounded by family, on Saturday, January 26, 2019 at home. Arthur was born in McKeesport, PA on June 17, 1930, the 10th surviving child of John and Catherine Magyar. Arthur is survived by his wife of 61 years, Dorothy, of Gaithersburg, MD (formerly of Liberty Boro, PA); Daughters: Christina Moret with husband David; Kathleen Pavesi with husband, Michael (d. 2018); and Lisa Goetz with husband Paul; Grandchildren: Peter Moret, Michael Moret, Amy Moret, and Katherine Goetz; Sister: Elizabeth Kojundzic with husband Michael of Brooksville, FL; and many nieces and nephews. Arthur is preceded in death by his siblings, Walter, John, Frank, Alex, Albert, Frances, Helen, and Edward. Arthur was a member of the St. Mark, (formerly St. Eugene) Roman Catholic Church in Liberty Boro, PA. He worked as a mechanic for the Port Authority and formerly as a machine engineer with Continental Can both in McKeesport, PA. During his retirement, he worked as a starter at Butler’s Golf Course in Elizabeth, PA. Arthur is a Veteran of the Army and served in the Korean War as Private First Class for the 58th Signal Support Company from February, 1952 to January, 1954. He was awarded the United Nations Service Medal, the National Defense Service Medal, the Korean Service Medal with 2 Bronze Stars, and the Good Conduct Medal. He enjoyed billiards, golf, flea market and antique shopping, folk music, home repair, playing cards, and spending time with family. Always remembered as having a wonderful sense of humor and quick wit, Arthur will be missed and will always be beloved by his family, extended family, and friends.